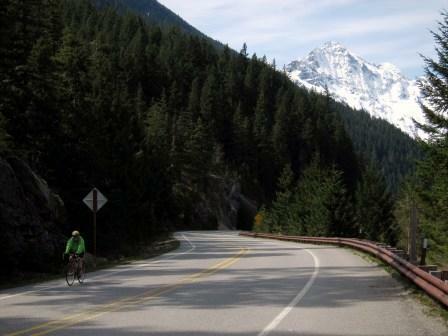 Earlier this month, an application for official recognition of US Bicycle Route 10 — Washington State’s first in the US Bicycle Route System — was jointly submitted by Washington State Department of Transportation and Washington Bikes. The application went to the American Association of State Highway and Transportation Officials (AASHTO) and will be reviewed by the Special Committee on US Route Numbering at their May meeting. USBR 10 travels 416 miles across the northern tier of our state. It will continue into Idaho to the east and connect to the San Juan Islands and Canada at its western terminus in Anacortes via Washington State Ferries. This route climbs four mountain passes, including Sherman Pass at 5575 feet, and takes the bicycle traveler through spectacular landscapes and friendly towns. Our on-the-ground work to create USBR 10 took over two years and has been a labor of love for WAbikes board member and mapping volunteer John Pope of Anacortes. We owe a round of high fives to him, Barb Culp of Seattle and Lynn O’Connor of Colville for their field work and energy. You can preview route maps and sign up to receive an announcement about the official designation and celebration on our USBR 10 page. The US Bicycle Route System is a developing network of national bicycle routes that has been championed by Adventure Cycling Association. 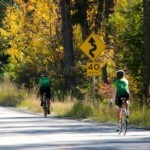 Nearly 6000 miles of US Bike Routes have been established in a dozen states so far. Currently, over 40 states are working on creating US Bicycle Routes. This article was posted in News, Tourism, Travel, USBRS. Bookmark the permalink. Follow comments with the RSS feed for this post. Both comments and trackbacks are closed. 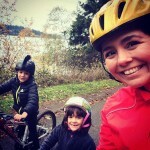 Thank you for all you do for bicycling in my home state of Washingt6on. I can see a HUGE improvement in the Inland Northwest cycling infrastructure in the 26 years since I moved back into the area.